Pooh hasn't much Brain, but he never comes to any harm. He does silly things and they turn out right. There's Owl. Owl hasn't exactly got Brain, but he Knows Things. 'Winnie-the-Pooh may be a Bear of Very Little Brain, but he sometimes has surprisingly astute and helpful observations on life. Full of thingish thoughts and clever plans, this is the perfect gift for deep thinkers and the philosophically inclined. 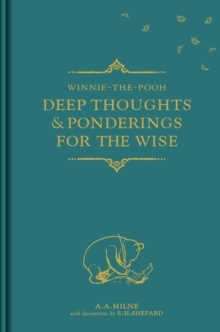 It is part of a brand-new range of Winnie-the-Pooh gift books for adults - a beautifully presented range of four books to collect and enjoy!